For the second time now, the family-owned business in Frankfurt has undergone an in-depth appraisal by the French rating platform – the KERN Group is among the top 30% of rated companies. Frankfurt am Main. 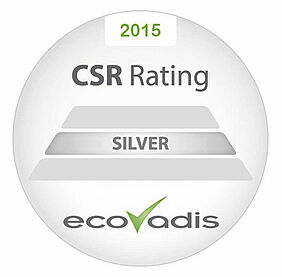 The team of analysts from EcoVadis has certified the KERN Group’s outstanding Corporate Social Responsibility Management. This certification’s basis for evaluation is compliance with international standards, such as the principles of the United Nations Global Compact, whose members – among them also the KERN Group, as the only language services provider – promote a socially and environmentally responsible global economy. Thus, the family-owned company sends a clear signal for more transparency in international economic relations. Last year, the language services provider was able to convince the CSR (corporate social responsibility) team of experts with its commitment in four assessment areas: environment, labor practices, fair business and sustainable procurement. This year, the KERN Group has substantiated its efforts in these areas through additional measures. With the internationally recognized EcoVadis certification, the KERN Group sets itself apart on a global level from other LSPs and again proves its continued commitment to transparent, sustainable and socially responsible business practices. “With this certification by EcoVadis, we are sending the signal to our customers and business partners around the globe that sustainability and social responsibility are high priorities in our company policy. This transparency forms the basis of trust our stakeholders have in our services,” states Michael Kern, member of the KERN Group’s Executive Board.